In the immortal words of Inspector Harry Callahan, a.k.a. Dirty Harry: "I know what you're thinking, 'Did he fire five shots or did he fire six?' Well, frankly, I lost count myself in all the excitement. And seeing as this is a .44 Magnum - the world's most powerful handgun - likely to blow your head clean off, you've got to ask yourself a question: 'Do I feel lucky?' Well...do ya, punk?" If you know any men in your life (especially fathers) then get ready for some testosterone-filled, fist-pumping, manly-man movies on DVD. Last week saw the release of the entire Rambo collection from the tragic anti-war movie, First Blood to the uber cheese-fest Rambo. If you missed out on that one, not to worry, this week you can pick up the entire Dirty Harry collection on DVD and Blu-ray. You can buy each movie separately but the collection comes with a boat-load of interesting collectibles and new interviews with the films's creators and Clint Eastwood. Eastwood originally had to pass on the role because of scheduling conflicts, so the part went to Frank Sinatra who was more than happy to take on the role of vigilante-with-a-badge Harry Callahan. Lucky for us Ol' Blue Eyes was recovering from surgery to his hand and couldn't hold El Canon .44, much less shoot it. So by the time Warner Bros. picked it up, Eastwood was available and he pounced on it. Nothing against The Chairman of the Board (may he rest in peace) but I just can't picture the one time crooner pointing a hand cannon at a would-be bank robber and saying, "You've got to ask yourself a question: 'Do I feel lucky?' Well...do ya, punk?" Cue song-and-dance number as background extras suddenly move with choreographed precision as the undisputed leader of the Rat Pack starts singing, "Dooo I feel lucky tooo-night!" You get the idea. The first movie, Dirty Harry, is rather slow-paced and drawn out at first glance. There's hardly any suspenseful music or dramatic camera angles to punctuate the tension of hunting down a serial killer. Compared to this, a film like Se7en, one of the movie's direct descendants, feels like an aerial dogfight at 50,000 feet, flying at Mach 2. The primary fault lies with the editor in this case and, to a smaller degree, with the director as well. Editing was sharp but the cuts came two or three beats (sometimes four or five!) after they should've been made. But looked at as a whole it's clear that the director, Don Siegel, was aiming for higher art. Just take a look at how he ends the stadium pursuit sequence and you'll see what I mean. 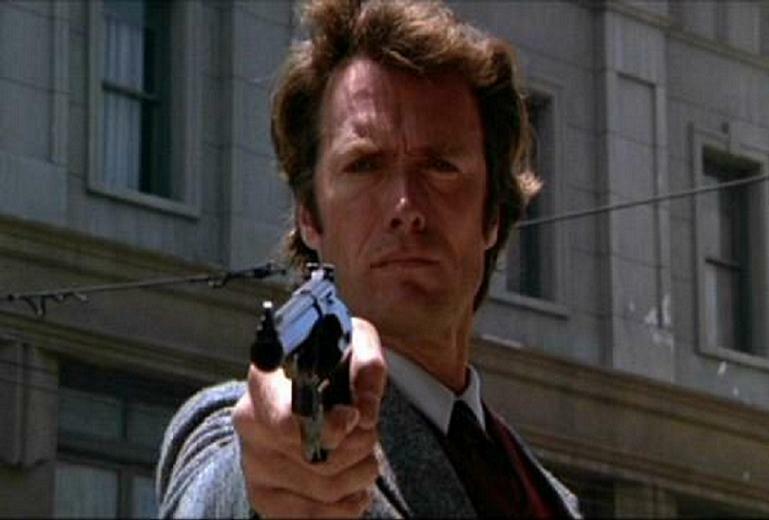 It isn't until the second movie, Magnum Force, that Dirty Harry lives up to his name. Just "look at the bones!" The total body count in Dirty Harry was 7. The total body count in Magnum Force was a whopping 30! Given the John Woo standard of today, 30 doesn't sound like much but it certainly made for a faster-paced, white-knuckled roller-coaster ride (yes, how many cliches CAN I fit into one review?) of a movie! Below are the links for the Ultimate Collector's Edition and the individual films. The second row consists of the Blu-Ray versions. As of this writing, only the full set and the first film are available for purchase.